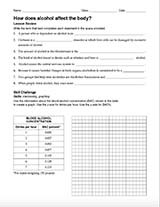 This science printable asks students questions about the musculoskeletal system of the human body. Students are asked to identify muscles as flexors or extensors, and must analyse diagrams of muscles in a human arm. An answer key is provided.